We played a version of this scenario a few months ago. I have reworked it a little so it should offer a different battle. We will try out using larger infantry divisions and cavalry divisions run by the CinCs using only AI control and no TCing. This map also has the advantage of having a fair amount of woods that will also offer protection to the infantry if needed. Mikhail Borozdin is cranky today. The Russian 8th corps, under the leadership of the General Lieutenant has doggedly followed the French rearguard, commanded by Count Dessaix. Try as he might, Borozdin has been unable to slow the French withdrawal and allow the Russian army to bring on a larger engagement. An expected fight for the highlands in the SE corner of the map never materialized. Rather, the French kept withdrawing to the NW. 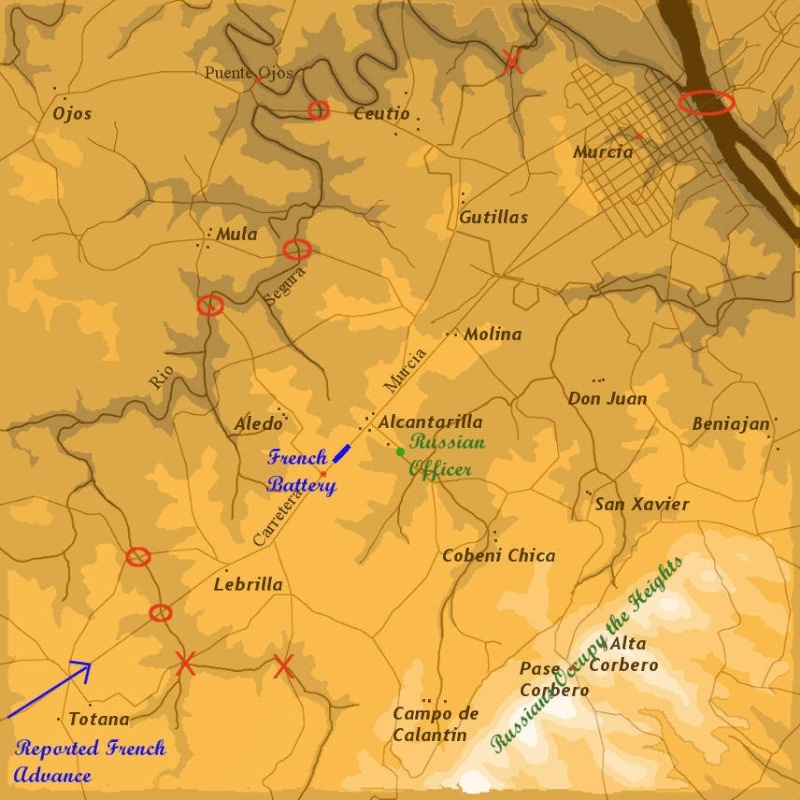 Around mid-afternoon, a Russian officer rode towards the town of Alcantarilla. There he sighted a battery of guns. Likewise, his presence was noted by the French. It appears Dessaix's men will make a stand here, on the road to Murcia. The major rivers on the map, Rio Segura and the large river to the NE, are uncrossable except at the bridges which are circled. Also, cavalry and artillery may not cross the fortifications around Murcia. They will have to use the roads to move in and out them. Infantry are under no such restrictions. Also note that although many of the trees have been removed from the map, these regions will still prevent cavalry from charging. These areas have the usual dark brown ground and the toolbar will display that they are woods. This 3 hour battle will be fought on the Lynchburg map. Only the usual 3 mods are needed. All the map stuff is in them. In this battle, the divisions will be larger than in the recent past. This will allow/force each division commander to create a small reserve force. Also, the cavalry will be under direct command of the CinC. However, none of the cavalry brigade commanders or squadrons can be TC'd, (the division commander can be TC'd and probably should). They have to remain under AI control when they go into battle. This will reduce their potency and give the infantry commanders enough time to move to their threatened battalions and get them into squares if need be. The French did a lot of backing up in 1813. However, as French CinC next week you will have an opportunity to advance and drink from the keg of glory. I did say "most of the time" - one can hardly call 1812-1815 "most of the time"
If the game starts at 2:30 or 3 EST I will volunteer as a C in C: however I must leave by 7:30 EST as I have a bunch of chicanery planned Saturday night. She's off and coming with us in a bachelor party for my goal keeper..... If the game doesn't start by 3ish I will happily take a brigade!!! You're French. The Man always kept the reserve under his personal control. Besides, with the AI actually moving the brigades, there will be plenty of delay. At Eylau Napoleon simply pointed towards the enemy in the center and looked at Murat and said "Are you gonna let those fellows eat us up?" Cavalry doesn't behave exactly like infantry due to the fact that the squadrons are much smaller than the enemy infantry battalions and the commanders are much more timid. They will begin to move forward as ordered but will size up the potential for success before moving into combat. It is a much more deliberate affair. Try it out in SP. I think you'll find that they delay and misinterpret your orders just as well as any human. No C-in-C for me either. If I'm going to control cavalry, i'll play them however I want to play them or not play them at all......sorry! I'll take on a CinC spot this time. Should be a blast. excellent - seems finding CinC isn't that difficult anymore... well done! Excellent Ron. You get first choice, Russian or French? Roland gets a brigade of opolchenie. Those pitchforks are awesome. Been hankering for beluga, borscht, and red cabbage lately. Have to channel Borozdin in this one. Besides, we know Mark has heard that teams going 4 - 0 (even those preferring snails) are historical certainties to make the playoffs. Your staff is laying in a supply of hats as we speak. Briefing to go out shortly. We still need a French CinC. Better still, you're also a Polish prince, complete with tight pants and a great uniform. I'd like a Russian command if possible. I thought you preferred attacking, Martin? The starting time is yet unknown. We will need a minimum of 8 players and we haven't reached that yet. If Saturday is bad for you, there is always the chance we will play it on Sunday. That is if you are conscious by then. I should be good to go at 3 sunday. Unless im dead or in jail. No, I just know I'm the best. Now news yet, it can be tomorrow or within one week. If possible, I will be there...it is in the hands of nature. My vote is for Tuesday being the day of celebration. nono - Pepe will be CinC on Saturday - and at the crucial moment his wife will scream "I am having your baby - get out of the freakin saddle and drive me to the field hospital"